David Cameron's long awaited letter to Donald Tusk setting out his "demands" for his renegotiation of the UK's relationship with the EU has been published and it's decidedly underwhelming. The EU already has more than one currency and with the UK and Denmark having permanent opt-outs from the €uro it is always likely to have more than one currency. Any such discrimination would be illegal under existing treaties. Furthermore, the EU Court of Justice has already ruled this year that the EU Central Bank can't require banks to move to a €urozone country to clear €uro. The single market was established by treaty, it's what the EU is supposed to be about. What challenges to the integrity of the single market have there been that means something has to be done to protect it? This is asking for a solution to a problem that doesn't exist. The creation of a banking union would require treaty change and treaty changes require a unanimous vote by member states. If a treaty was presented that included non-€uro countries in a banking union then don't sign it. It's as simple as that. The Vienna Convention on the Law of Treaties says it's illegal to coerce a state into signing a treaty so any attempts to punish or disadvantage non-€uro countries for not signing up to such a treaty would be illegal under international law. The only money from non-€uro countries that's been used to bail out the €uro is money that was put into funds for that purpose. David Cameron got an unenforceable political agreement that the money wouldn't be used to bail out the €uro but they changed their mind and did it anyway. The simple answer is, don't put money into a bailout fund if you don't want it spent on bailouts. Again, this is something that can't be imposed on the UK as a non-€uro country. The British government have voluntarily given the EU competences in the financial sector that it shouldn't have had but the solution to that is not to give power away to the EU just because they want it. Really? So no bilateral talks between member states any more? Everything that affects all EU members has to be talked about in EU meetings in Brussels or Strasbourg with everyone present? That's a step backwards, it means we can no longer conduct our own diplomatic relations with EU members. It also means no more David Cameron jetting off to EU members one by one for private talks on "reform" of the EU that will affect all members. Not a cut in regulations. Not even a reduction in the burden of regulation. Just a target for the reduction in the burden of regulation. This is completely meaningless. The principal of ever closer union is just words, it has no legal standing. Equally meaningless would be any pledge by politicians that we were exempt from ever closer union because the EU, its bureaucrats and bodies would all still be working towards ever closer union. This procedure already exists. The EU Parliament can't pass legislation without the agreement of the EU Council of Ministers. Even where the EU Council uses Qualified Majority Voting - the lowest bar to pass EU legislation - they need 73.9% of votes and a majority of member states to pass it. It's not that hard to stop EU legislation in the EU Council, they just don't want to. Parliament is sovereign. The EU is already subservient to national parliaments in law, it is just in practice that they allow the EU to have primacy. The solution to this is to just say no. This is nothing new. It has been applied to every new member since 2004 when half of eastern Europe joined the EU. And since every new country that joins the EU is going to be progressively poorer than the current members, it will quickly reach the point where their economies will be so weak that they won't approach EU standards for decades. Temporary bans for some criminals that have committed fraud? Why not a permanent ban and why isn't this being targeted at child abusers, murderers and violent criminals? Everyone should have to obtain a residency permit to live here but if we were to stay in the EU then an EU citizen's non-EU spouse should have to obtain a residency permit as well. We have discriminated against most of the world - including our friends in the Commonwealth - to compensate for the fact that we can't control the number of immigrants coming into the country from the EU. EU citizens aren't checked when they come here, they go through fast track lanes. They aren't required to notify the authorities that they intend to move here and don't have to go through any of the checks that people from the rest of the world do to make sure they're not personae non gratis. Clever wording here. They must "contribute" for four years. The letter doesn't say they must contribute to the social security system, just that they "contribute". That's very vague and no doubt intended to encompass the vague notion of contributing to society, not actually paying into the system. And note the very specific wording of "in-work benefits or social housing". No mention of unemployment benefits, incapacity or disability benefits, maternity and paternity benefits, free school meals, council tax benefit, housing benefit or child benefit for instance. How would this be enforced? How will someone be able to tell whether money sent abroad was child benefit or from some other source? Cameron's letter is weaker even than many had expected with no attempt to deal with any of the major issues that underline our membership of the EU. Yet even with these limp, largely meaningless superficial requests EU leaders are already starting to rule them out. 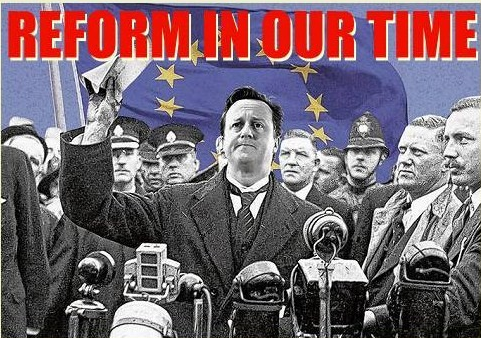 There will be no meaningful reform of the EU or the terms of our membership. The EU is fundamentally wrong for us and the federalist project has gone on for too long to change its direction.